Oil major BP and Norwegian independent Aker BP announced October 3 they have agreed to co-operate on the development and deployment of advanced technologies. Through their planned strategic alliance, the duo intends to explore potential venture capital investments targeting technology improvements, including developments in digital twins, advanced seismic techniques and processing, and subsea and robot technology. It may also identify innovations which could improve the environmental performance of offshore oil and gas production. A digital twin is a virtual simulation of all or part of an offshore platform or its control systems that continuously learns and updates itself, enabling training, maintenance and other functions to be undertaken remotely and/or more cheaply and safely. Aker BP is owned by BP (30%), Norway's Aker group (40%) and other shareholders (30%). BP Ventures has invested over $400mn in corporate venturing and has 42 active investments. 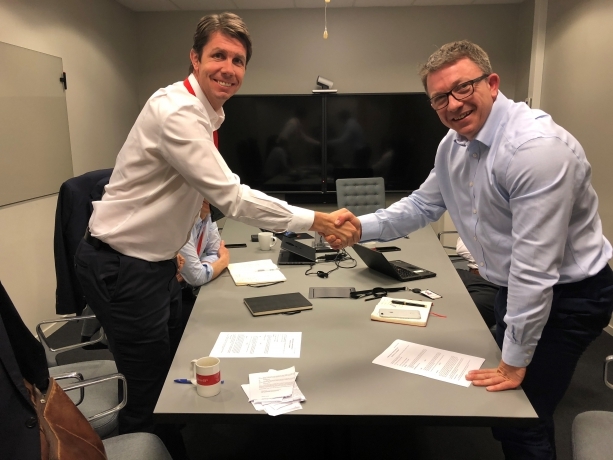 This week's BP/Aker BP agreement was signed by Aker BP CEO Karl Johnny Hersvik (right in picture below) and BP Technology chief commercial officer Steve Cook (photo credit: Aker BP).